This Week for Dinner: Vote for Clean Air and a Happy Earth This November! Vote for Clean Air and a Happy Earth This November! Hey, guys. I don’t get political here on the ol’ blog. I believe all sides of all issues have valid arguments and, well, this is a food blog and not really the place to hash out those issues and arguments. But you do know that I care deeply about the environment and write about environmental issues all the time. In addition to caring about the environment, I am a firm believer in the idea that every little bit helps and that all of our cumulative small actions lead to big change, hence a focus on my blog over the years on things like cutting paper towels, composting and eating less meat. In case you weren’t aware, there is an election in two weeks. (Hahahahaha! I am so funny!) I am not publicly backing any candidates or telling you which way you should vote. But I am excited about voting and have gotten more involved on the local level this year than I ever have. I am really excited to turn in my ballot and have loved talking with my kids about the election. I was recently approached by the Clean Air Moms Action to see if I’d be willing to encourage the same excitement among my readers and I was like, YES! And, no matter where you fall on the political spectrum, I also want to encourage you to consider clean air, environmental factors and climate change when you vote. I am not a one-issue voter, but if I was, the environment would be that issue for me. I feel like this election season (and society at large) is like Game of Thrones. In Game of Thrones you have all these warring and competing political factors, all vying for power, all doing anything and everything to get that power. But while that squabbling is happening, “winter is coming,” i.e. literal winter but also those scary glassy-eyed White Walkers that the politicians don’t even believe exist. For me climate change is that proverbial winter. We are concerned with all these other issues while the environment, the one thing that is absolutely crucial to our survival, gets largely ignored. Rising waters are eating away at our coastline (interesting NY Times report here and Wharton podcast here). Drought will not go away. CRAZY WEATHER (no links necessary!). All of it is happening, and yet the presidential debates barely touched the issue, with 82 seconds in the first debate, one question from the audience for the second debate (go Ken Bone! ), and two seconds in the third debate, despite the fact that “How will you address climate change?” was the fourth most popular question submitted to the Open Debate Coalition. What the WHAT. Okay, obviously I have a strong opinion about all of this, so I’m going to cut myself short and just ask you to think about the environment when you vote. I’m not asking you to make it your one issue (although I’d be cool with that! ;)), I just want you to give it some good consideration. The changing climate is impacting food production and so much more. Let’s get ahead of the problem and make some positive changes, starting with our elected representatives and ballot initiatives! 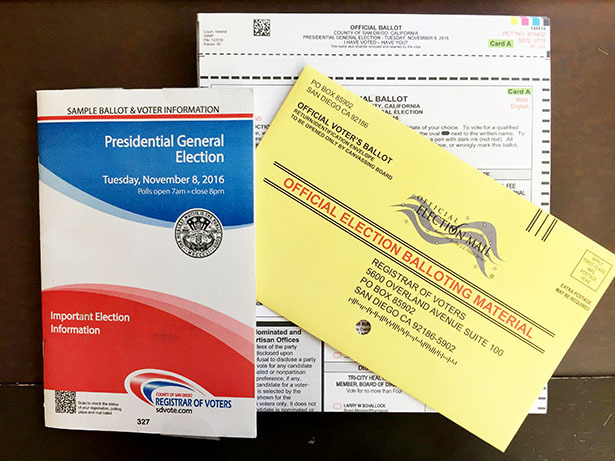 There are tons of great voter guides online, partisan and non-partisan alike, where you can find out where candidates stand on this issue. If you’re a fan of the Sierra Club, you can view their endorsements on this page. Seek out good resources and learn all you can. Vote as if your child’s health depends on it…because it does! And if you are feeling as pumped up about this issue as I am, go to Clean Air Moms Action and pledge to vote! We live in an imperfect yet great country and I am grateful for my opportunity to participate in our democracy. Happy Voting! Happy Earth! This post was produced with support from Clean Air Moms Action. Tammy, I just want you to know a lot of thought and pondering went into this post and whether or not to share it. In the end I felt good about posting this and believe it is very authentic to the blog, my writings and my overarching theme of “eat well, heal the planet.” I respect all opinions and tried to make that message very clear in the post as well. I feel like there is always great dialogue with my readers and it has always been very positive, with people willing to discuss issues and hear both sides. I actually have felt grateful over the years for this happy little corner of the Internet we have here at This Week for Dinner! It is too bad we won’t be seeing you around anymore. Best wishes! Thank you for this post! I disagree with the previous commenter Tammy. No parent rushing to the emergency room pre-dawn because their child cannot breathe ever thinks about political party or what might be an “allowable” level of pollution. No, that parent only wants their child to be able to breathe. Asthma and a host of chronic lung diseases affect people of all political beliefs. The same pollution making our kids sick is also causing our climate to change at an accelerated rate which should be concerning for parents. As the mother of a very active 4-year-old boy, I don’t believe that my demand for my son to breathe clean air while playing outside with his friends belongs to anyone political party. All of our children deserve leaders in all levels of government who care about protecting their little lungs from harmful pollution. Every parent and grandparent has the right to ask our elected leaders for this basic form of protection. I think the broader media has politicized these issues making people feel that if you support clean air protections you must be a liberal. I just disagree. There are plenty of candidates in all political parties on the ballot that are good on these issues. I actually found your website because of your posting on get out to vote. I am a mother of two boys and am always looking for healthy easy meals and see that you hold similar views to my own and have signed up to be a member. My youngest was diagnosed with cancer at the age of 3 and as you can imagine that was a turning point in our lives. I evaluated everything that he was exposed to and made big changes in what I feel impacts my children’s daily health the most – food and environment. These issues are interrelated and I make the best choices for my family based on the things I can control. However many things like the air my kids breathe outside is out of my control and I depend on elected officials to protect my children from dirty pollution. This is why it is so important to vote in every election for candidates who will protect our children. I live in Southwestern PA where fracking is rampant and industry has set up business next to my kids school. You better believe I will be voting as if my children’s health depends on it. welcome, PT. and thank you so much for sharing your story. truly, I appreciate it so much! Thank you for your post, Jane. It is so important that we get the message out about how important it is to consider the environment when heading to the polls during this and every election. Like the others who have commented before me, this is not a red or blue issue, it’s a human issue. There are no two sides to caring for the planet, ourselves, and each other. Pollution from carbon, methane and other greenhouse gases has no boundaries. Scientists from all over the world have affirmed that it will affect everyone, no matter where you are. It’s no longer time for us to sit back and watch as we head straight for the giant iceberg. I certainly want to be able to look back and tell my loved ones that I tried everything I could to make the planet better for them. Thank you for shedding light on this important topic. I look forward to following your other posts! you’re welcome, karina, and thank you! amen to all of it! thank you so much for sharing your thoughts and family’s experiences, sasha! Jane, thank you so much for this post. Everyone wants clean air and safe water for their family. And everyone should vote. 97% of climate scientists agree that our climate is warming due to human activities. This is not politics. This is scientific fact. So, you should feel good about posting about this on a food blog because climate change threatens our waters and our global food supply. And how we vote in this election will impact how we deal with a warming future. Again, bravo for standing up for those who want to “eat well and heal the planet.” You now have a new subscriber and I can’t wait to try some of your delicious healthy recipes! Jane, thanks so much for sharing this post. Clean air isn’t just a political issue — it’s a deeply personal one and I’m glad you care about it! I actually really like it when bloggers leave their well-worn writing path and give us a peek into other things that matter to them. So thank you for this post and the call to action. Jane, thank you so much for this post. Clean, breathable air is the right of everyone and we deserve it! This is why going out and voting is so important, glad you posted this. Hi Jane! I’m the mom and mayor in the video, thank you for posting! As local elected officials, we are the first ones on the ground dealing with climate related disasters in our communities. Here in Colorado in the last few years we’ve experienced devastating floods and fires. The economic and human cost is real, and it’s happening right now. As we continue to see rising temperatures, the risk of more intense forest fires increases. We are in a powerful position as moms and dads to vote this year for climate; clean air and clean water. This in turn protects our precious soils and fresh food sources! christine, thank you so much for reading my post and showing public support for this very worthy cause! Thank you so much for posting! I wish we lived in a world where considering our environment and the health of our kids wasn’t considered political. I think of all the many things to question about the tone of our politics and elections, this is one of the biggest. I so wish we lived in that world, too, and agree wholeheartedly…the very fact that NONE of the debate moderators asked a climate/environmental question speaks volumes and is quite concerning. thank you for your support!! Thank you for talking about this. Our diet choices, and meal planning are also directly reflective of our ability to obtain healthy foods; and the cleanliness of the air and water used to produce those foods will have an impact on our health. There is no more important issue to us all than the availability of clean air and water, it impacts every part of our life. As they decline, so does our quality of life. Please vote for clean air.